Transparency is how easily light can pass through a substance. In lakes this means how deep sunlight penetrates through the water. Plants and algae need sunlight to grow, so they are only able to grow in areas of lakes where the sun penetrates. The top section of the lake that sunlight penetrates is called the Euphotic zone. The area around the edge of the lake that is shallow enough for plants to receive light is called the littoral zone. 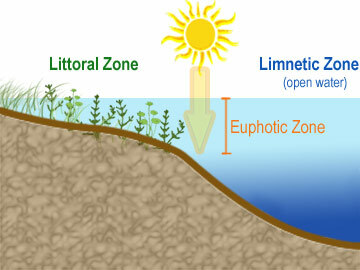 The area of the lake that is too dee p for plants to grow is called the limnetic zone (Figure 1). Water transparency depends on the amount of particles in the water. These particles can be algae or sediment from erosion, the more particles – the less water transparency. In other words, when the water is murky or cloudy and contains a lot of particles, the light cannot penetrate as deeply into the water column. Water transparency is measured with a Secchi disk (how to use a Secchi disk) . A Secchi disk is a metal disk, 8 inches in diameter that is lowered into the water on a cord. The depth that the Secchi disk can no longer be seen through the water is the Secchi depth. When the water transparency is high, the Secchi depth is high. 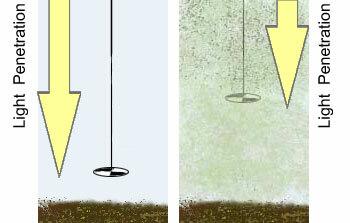 When the water transparency is low and cloudy, the Secchi depth is low (Figure 2) (more information on the relationship of Secchi disk to lake water quality). Conclusions about the trophic state of a lake can be drawn by measuring the Secchi depth (Figure 3) since water transparency is directly related to Total Phosphorous and Chlorophyll-a. An example of changes in transparency due to human impact would be if there is construction going on near the lake shoreline. The exposed dirt from digging gets blown into the lake by wind and washed into the lake by rain. This dirt makes the water cloudy in itself, but it also contains nutrients (phosphorus and nitrogen) that can cause algal blooms. Exposed black dirt and eroded shorelines should be stabilized by natural vegetation (or riprap if the slope is steep) to prevent impact on lake water quality (see Best Management Practices).